There is a heck of a lot of space up in space, plenty of room for everyone to get in on the fun and games. Competition is a good incentive to get the balls rolling upwards. BEIJING — China plans to launch space labs and manned ships and prepare to build space stations over the next five years, according to a plan released Thursday that shows the country's space program is gathering momentum. 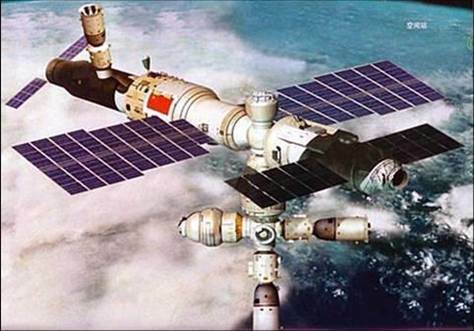 By the end of 2016, China will launch space laboratories, manned spaceship and ship freighters, and make technological preparations for the construction of space stations, according to the white paper setting out China's space progress and future missions. China's space program has already made major breakthroughs in a relatively short time, although it lags far behind the United States and Russia in space technology and experience. The country will continue exploring the moon using probes, start gathering samples of the moon's surface, and "push forward its exploration of planets, asteroids and the sun." The paper also says China will improve its launch vehicles, improve its communications, broadcasting and meteorological satellites and develop a global satellite navigation system, intended to rival the United States' dominant global positioning system (GPS) network. Its space principles — including peaceful development, enhancing international cooperation and deep space exploration — are largely unchanged from its previous two documents detailing the progress of China's space missions, released in 2000 and 2006. In 2007, it launched its first lunar probe, Chang'e-1, which orbited the moon, collecting data and a complete map of the moon. Since 2006, China's Long March rockets have successfully launched 67 times, sending 79 spacecraft into orbit. Some elements of China's program, notably the firing of a ground-based missile into one of its dead satellites four years ago, have alarmed American officials and others who say such moves could set off a race to militarize space. That the program is run by the military has made the U.S. reluctant to cooperate with China in space, even though the latter insists its program is purely for peaceful ends. "China always adheres to the use of outer space for peaceful purposes, and opposes weaponization or any arms race in outer space," Thursday's white paper states. The Chinese government's policy is to "reinforce" space cooperation with developing countries and "value" space cooperation with developed countries. The paper lists cooperation between China and countries including Russia, Brazil, France and Britain, and says of the United States: NASA's director visited China "and the two sides will continue to make dialogue regarding the space field." Wow, China sure has the man power to get the job started/done by 2016. Lou, will China's space chase be backed up covertly by the US military? John has stated that many space platforms (DOD) already exist, so it will be getting pretty crowded in high/near Earth orbit, no? will the Van Allen belt be an issue or will China get an assist (as with everything else on this planet) from ET? China has gotten a lot of US military backing, via five finger discount. ET has also started to give them stuff. Many platforms up there now but there is boo-coo elbow room up there, enough for a heck of a lot more human stuff. Van Allen is a technological glitch remedied by ET technology. Nevertheless, space is dangerous and hazardous and accidents and sabotage will make things interesting. I say we start our own space program...start our own Moon Base. ...err maybe you said that last year Lou. and Lou that was a wonderfully warm December for chicagoians. I'm serious about the space program part. Lou have you seen this flare that came out of Venus? Hot stuff on Venus. Earth has Yellowstone. Mass eruptions happen now and then on little planets, when things get hot under the collar.